Today’s Q and A entry is on Jeremy Guthrie. Starting pitcher for the Baltimore Orioles. Since recording his first complete game back in August of 2008, Jeremy Guthrie has pitched his way to success with the Orioles. Earning a name for himself as one of the O’s best pitchers. 1.) Favorite type of music. 7.) Favorite thing to do in free time. 8.) Favorite time of year. 9.) Favorite sport, besides baseball. 10.) Favorite player growing up. 13.) Favorite subject, when in school. 15.) Favorite moment of baseball career thus far. 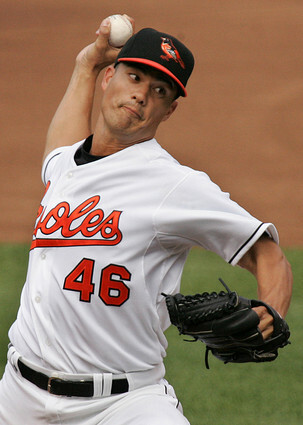 I hope this helped you to learn more about Jeremy Guthrie of the Baltimore Orioles. Big thanks to Jeremy Guthrie for answering my questions. The next Q and A entry will be posted Wednesday, August 24, on Bryan Harper, of the Nationals organization. PAST Q AND A ENTRIES: Brent Lillibridge, Daniel Hudson and Mike O’Hara and Ryan Wagner. This entry was posted in Dailies and tagged Baltimore Orioles, Baseball, Bryan Harper, Jeremy Guthrie, Nationals by Matt Huddleston. Bookmark the permalink.